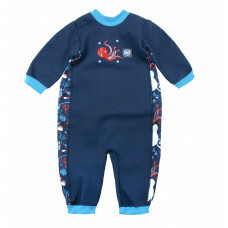 Our award-winning special, fleece lined baby wetsuit is perfect for children who can't take chilly pools, windy beaches, play pools with water sprays and splashes, or those with very sensitive skin. The Warm-In-One is easy to get on and off with a wide opening back. Covering arms, legs, and trunk, to retain core warmth. Perfect to use on the beach, as it also gives UPF 50+ sun protection and is wind and sand resistant meaning baby stays warm whilst getting wet making sand castles or paddling. Cold water takes the joy away from a young child. Warm babies are happy babies and nothing is warmer than a Splash About Warm in One. 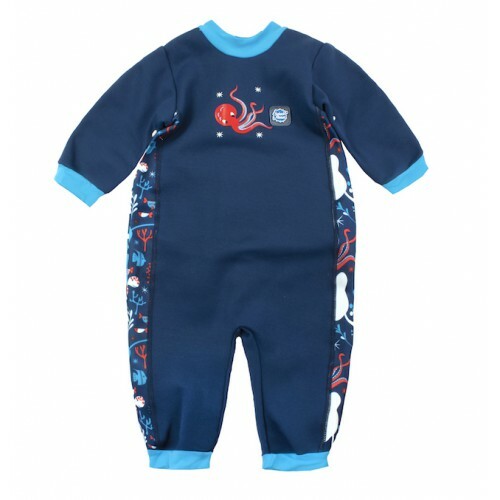 They grow up water confident in a Warm-in-One swim thermal and enjoy being out in the pool. Excellent for babies with sensitive skin, eczema or dry skin conditions because barrier creams and eczema cream do not rinse off in the pool water.